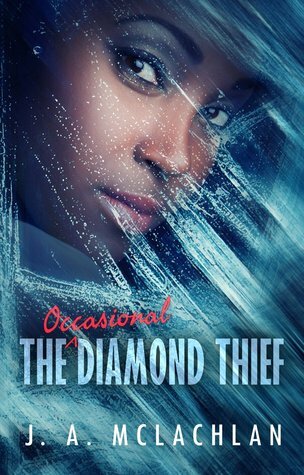 The \ Occasional / Diamond Thief is a YA adventure scifi novel. Our heroine, Kia Ugiagbe, is the 15-year-old daughter of a fairly unsuccessful trader. Her father has been sickly as long as she can remember, suffering episodes of fever and weakness ever since he'd travelled to a faraway frontier planet, Malemese. He never talked about what happened there, but it has left its mark on him. On his deathbed, Kia is the only one he can talk to any more, because she's the only one to have learnt the Malemese language. Malemese is the language he falls into when suffering fever hallucinations. In his final moments, he reveals a secret he has kept all those years: hidden at the back of a drawer, there is a little bag containing a huge diamond which could only have come from Malemese. Her father, she realises, must have stolen it. Fast paced, fun, and tense, The Occasional Diamond Thief is a brilliantly absorbing novel. Kia is easy to root for: she's hard-working, not brilliant at everything she does (especially her people skills are a subject she struggles with), but dedicated to her work. At times, she reminded me of Pat Rothfuss's Kvothe: all her skills are hard-earned, but unlike Kvothe, she isn't magically gifted at everything. She has a sense of humour and just the right amount of cheek: enough to put a twinkle in the reader's eye, not so much that she becomes annoying. She stumbles into her adventures, and though some are forced upon her, the story never loses the main thread of Kia's desire to understand more about her father, and the man he was before the sickness that would ultimately destroy him. It's not a flawless novel - the mother is a bit too simplistically drawn as a character, and some of the scene changes are disorienting - but it's one of the best YA novels I've read. Better by far than Hunger Games, and on a par with Ian McDonald's Planesrunner series. Huh. This actually sounds really fun!